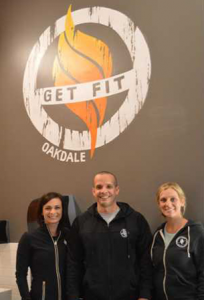 Get Fit Oakdale owners, Allison and Bear Walters, along with Shonna Orique are the three sole trainers greeting clients as they enter the newly opened Get Fit Oakdale. Allison Walters is happy to be ‘home.’ The Oakdale High School alum and mother of two has returned to Oakdale with not just her family, but her passion. In December, Allison, along with her husband Bear, opened the doors to Get Fit Oakdale. The opening of the gym facility at its 120 East F Street location was long awaited by many in the community, thanks largely in part to the reputation and teachings of Get Fit Modesto. As prior members and trainers of the Modesto gym, the couple has partnered with founders and owners of Get Fit Modesto, Jonathan and Tara Crenshaw, to replicate the same atmosphere, as well as workout at the Oakdale location. Each location is individually owned by the husband/wife teams. As the couple set their sights on returning to Allison’s childhood home, the Crenshaws planted the seed in their ear for a future endeavor. Leaning on their faith and prayer, the couple shared they began to walk the path to bring Get Fit to Oakdale. Noting the importance of doors opening at the right time and as they should, one such door brought them to their current location one year ago this month. By April of this year, they had a deal with the building owner and renovations to the steel framed shell began. Essentially what appears to be ideal office space from the street was transformed into a spacious workout facility right in the center of town. The couple learned that the community loved the idea just as much. In mid-September, anticipating an October opening, the couple hosted an open house. Inside the East F location was still just a shell, and there was little to be seen by way of gym equipment and set up at that time. Shockingly, people signed up sight unseen. “There wasn’t even sheet rock,” Allison shared of the building state in September, noting that it quickly became apparent that the reputation of the Modesto location was adding to the early interest of having a Get Fit in the Cowboy Capital. Just one week after opening their doors officially earlier this month, the gym has over 100 members utilizing its services. The Walters, however, are not set on offering a typical gym experience – the traditional get in, get your sweat on and get out. Their focus and the team of trainers, which they wish to build is more focused on community and support of one another. Currently the Walters, along with Shonna Orique, coach the eight 45-minute classes hosted during the six days of operation. Class sizes range from as few as six to a high of 15 with a capacity of 20. The gym also offers on site, staffed childcare. “It’s really important to us and Get Fit as an organization that we bring people up that have the same core values,” Bear said of expanding their trainer base. The couple went on to state that they recognize their gym may not be the best fit for everyone and they’re okay with that. “You get people connected and that’s where the growth comes from,” Bear added. Get Fit Oakdale offers a variety of class times, to suit multiple schedules. Their membership is based on a month to month, not an annual contract making it a bit more user friendly for those new to working out or unsure of the fit. A 30-day notice is required for cancellation. In addition to their memberships, they also host four- and eight-week boot camps periodically throughout the year. The first boot camp for the new location will begin Jan. 20, 2018. The owners intend to host an Open House event on Saturday, Jan. 6 from 9 a.m. to 11 a.m. For additional information and class times visit www.GetFitOakdale.com or call (209) 499-0573.